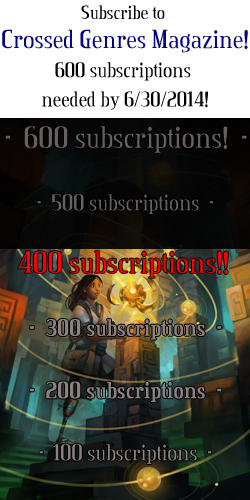 We’ve reached 200 subscriptions (which run through issue 18 or later)! As per our previous giveaway, 3 randomly selected winners have been contacted for a free ebook of any of our current titles! Now it’s time for another, even bigger, giveaway! And it’s a VERY important one for us! 300 subscriptions would be 50% of what we need for a year of CG Magazine. We’d be halfway to making the zine sustainable! When we reach 300 subscriptions, we will randomly select five subscribers to receive a free PRINT copy of any 1 of our current titles! We will also randomly select one subscriber to receive a print bundle of ALL OUR CURRENT TITLES! As of this post, we’re only about 80 subscriptions away from 300! If we get there soon enough, giveaway winners might get their books in time for the holidays! Everyone whose subscription runs at least through issue 18 is eligible. If you want a chance to win, please subscribe or renew now! We only have until December 31 to reach our goal! 29 days!